Wrekmeister Harmonies will release a new album this April via Thrill Jockey. 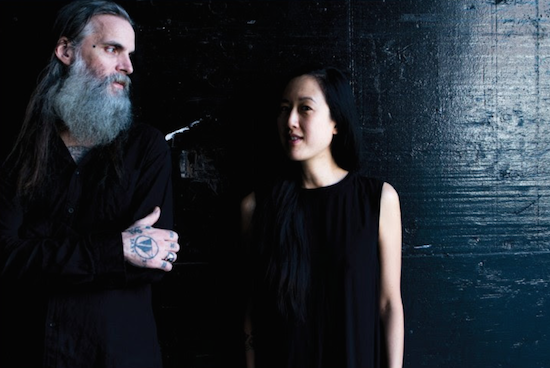 Entitled The Alone Rush, the album is preceded by a lead single featuring Swans' Thor Harris called 'Covered In Blood From Invisible Wounds'. You can hear it just above. The Alone Rush marks Wrekmeister Harmonies' first album release as the duo of JR Robinson and Esther Shaw. The album sees them shift the focus further towards Robinson's vocals. "After confronting the dual tragedies of the death of a loved one and the exhaustive experience of caring for another family member with a chronic illness, Robinson and Shaw removed themselves from the intensity of Chicago living to the seclusion of Astoria, Oregon," says a press release announcing the album. Robinson describes the period of recording the album as a "cult like affair, just the two of us, thinking the similar thoughts and working them out with hours and hours of conversation, totally alone". The album is out on April 13 and can be pre-ordered here. The duo will tour Europe through April and May stopping off in London on April 24 for a show at The Black Heart. For the full list of tour dates, head here.